Top 10 Extreme Choppers Bobbers and More! If you are looking for extreme bikes then you have to check out these custom choppers, bobbers, and out of this world concept cafe racers. There is no limit to artistic boundaries but these bikes take it pretty darn far, creatively speaking. Motorcycles have been around since the late 1800’s. Almost immediately, those who enjoyed the look and feel of the motorcycle began to customize them. While the older customized bikes were very different than the ones we see today, the art of customizing motorcycles whether chopper, bobber, café racer, or just plain radical has been a tradition for over a century. 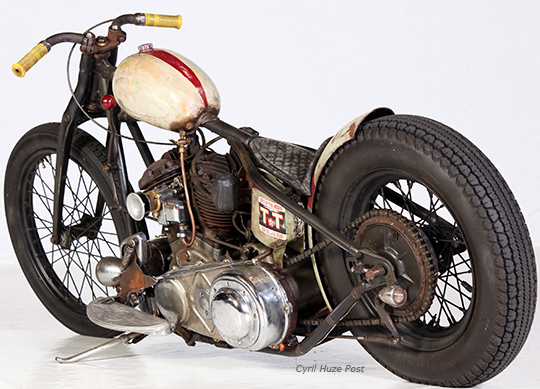 The chopper style of custom bike first appeared on scene back in the 1950’s in California. It has since spread worldwide. These bikes are usually the most radically modified with extreme angles as well as intricate paint jobs. Joe Palermo builds a custom chopper each year in his garage specifically to wow the judges and on-lookers at the Daytona Bike Week competitions. He pushes himself further and further each year, proving that the impossible can be achieved. This 2011 award-winner is built from the handmade soft tail frame up as well as other custom parts. Hans Bos builds one radical chopper each year, mostly for the sake of promotion for his custom shop based in the Netherlands. While it is hard to imagine how this bike can actually function with such radical components, it is functional. Bozzies doesn’t even plan anything out with computers or sketches, it is all from the imagination. 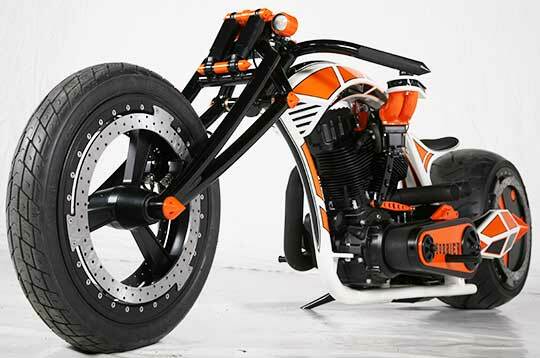 Dana Hallberg extreme custom motorcycle. Dana Hallberg named this custom chopper “Redonkulous” as the large front tire and stout rear tire give a unique look to the sweeping body. He decided he was going to be the first to utilize the 30” x 4” front wheel designed by Metal Sport. He did it, and he did it well. With other “Redonkulous” features, Hallberg set up his creation to compete at the Sturgis AMD World Championship and has won multiple awards. A bobber bike has several features: removed front fender, shortened rear fender, and stripping any parts that aren’t necessary to reduce weight while also giving it the traditional bobber look. These two bobbers are extreme in that they give two very different looks at what can be done with the bobber look. Roderick Braunius, based in the Netherlands, created this vintage-look bobber from a 1947 Harley U-Model. While not all parts are correct to the time period, the look surely is. It is a true bobber with all unique features of one: bob-tail rear fender, reduced weight, no chrome, etc. This look is sure to turn heads, especially with the vintage look back in style. Thunder Alley modern bobber build. This ultra-modern bobber takes a very different approach than that featured above. With radically sweeping lines, you still have the bob-tail look in the rear, even without a fender at all. 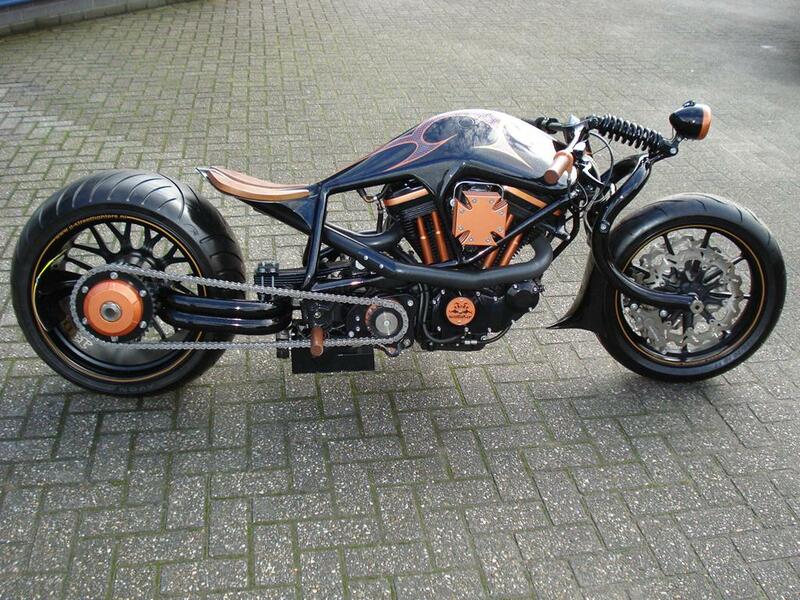 Built by Thunder Alley in the Netherlands, this blacked-out bike with orange accent to draw attention surely does bring the modern chopper look to the bobber look of the 1930’s through 1980’s. A café racer is specifically meant for speed with reduced weight. It doesn’t focus on power so much as handling and speed. Because comfort isn’t a focus in the design of a café racer, it is meant for short distance racing. AD Koncept cafe racer - frameless. 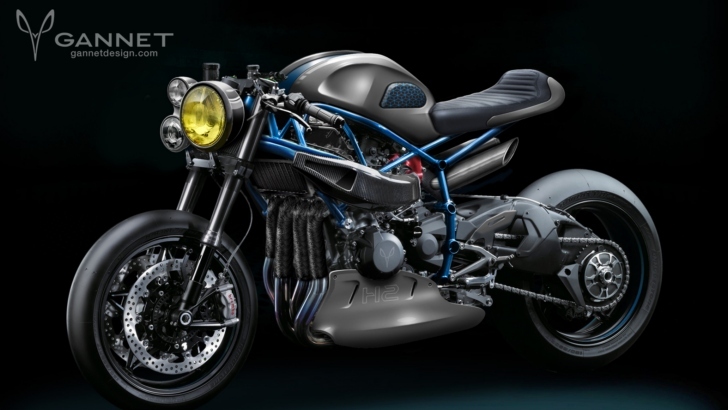 The Ducati Superquadro café racer bike is used as the frameless framework for the concept bike developed by AD Koncept. It turned heads at the 2015 EICMA show even through the crowds of other café racers that were trying to cash in on the trend. The basis for this concept is the Ducati 1199 Panigale and while some say it wasn’t the best choice to start with, it sure stunned onlookers. This bike, another concept but developed by Gannet Design, is the Kawasaki Ninja H2 R. With a 296-horsepower retro bike, outfitted with a supercharger, this concept bike is ready to shock those ready for a ride. It may have similar lines as the BMW R1200R concept bike, but they wanted to tone done the Batman look while keeping the same bad attitude. KTM cafe racer dirt bike. 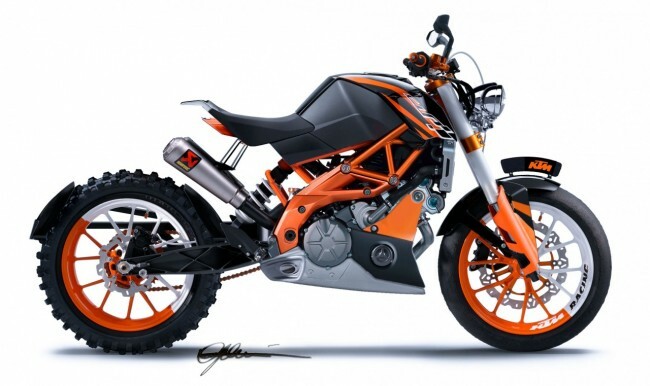 #3: KTM Concept – Dirt Bike, Bobber, or Café Racer? While some say the KTM concept is a bobber in disguise, I think of it more as a café racer. Maybe a bit of both? It has the signature orange look of the KTM designs but the bike itself seems to be a cross concept of several bikes, taking variants of them to create a truly custom look. There may be choppers and bobbers, and even those café racers, that can be customized to give you any look you want. However, there will always be those bikes that don’t really fit into any specific category but are still just as extreme. TT Custom Choppers 'Medusa' custom chopper. #1: Yes, it is really GOLD! This bike is one of the most expensive in the world. The Medusa, created by TT Custom Choppers, is seemingly made from a gold-tinted metal. However, that isn’t a tint. It is real gold. The designer, Tarhan Telli, incorporated over $1 million in real gold into the bike. 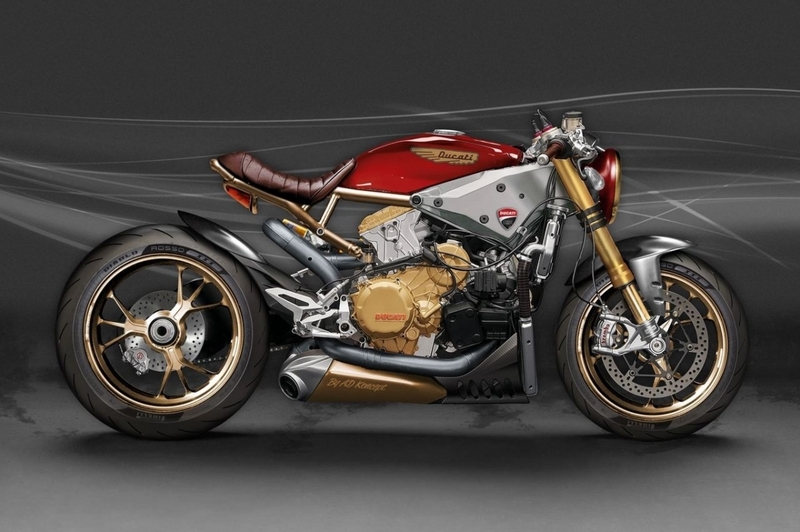 Because of the gold incorporated into the bike, it is also one of the heaviest bikes, weighing in at over 700 pounds. 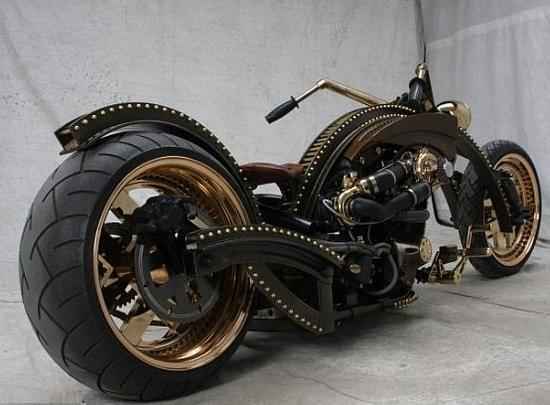 Barro Steampunk radical chopper build. Steampunk is all the rage right now as a modern look with Victorian era designs, mixing tech with vintage looks. Barro built this modern steampunk bike with custom looks but a T-Sable Springer engine and a Harley Davidson transmission. There’s nothing cookie-cutter about this design and it is sure to keep people looking. These extreme motorcycles are functioning pieces of art. Not only are they a treat for the eyes but for the rider, they offer a freedom you can’t get anywhere else than from riding. Might as well pick your favorite and image yourself riding off into the sunset on your steel horse.